A Tiki bridal shower is a fun theme for a summer bride-to-be. You can throw a Tiki wedding shower at the beach or in the backyard. In fact, as long as you have the decorations, food, and drinks correct, you can even throw a Tiki theme wedding shower at a restaurant or any place indoors. It's all in the planning but the sure-fire way to get the party started with the right atmosphere you'll need some amazing Tiki bridal shower invitations. ​That's where we have you covered! First up, we have a fun invite that shows a Tiki mug front and center. Zazzle has these in several colors but we chose the one with the orange polka dot background because it showed off the Hibiscus flowers so well. Next, we chose this beautiful Tiki invite because it looks so feminine with it's white background, gorgeous floral border top and bottom, and it's easy to read information area. And last but not least we've chosen this gorgeous bold design because... well, because of it's bold design. The flowers are amazing and don't you think the Tiki is incredible looking? If you don't agree that we've shared three of the best looking Tiki bridal party invitations, or you just want more choices, you can visit our affiliate, Zazzle, to see a lot more. I just came across these wonderfully modern and brightly colored bridal shower invitations that feature a coral reef design. ​These would be so perfect for a summer or beach theme wedding and if they're planning a warm weather or tropical destination wedding, this is super cute to use for their wedding shower. 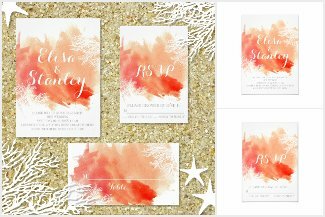 Stunning shades of orange, coral and peach are splashed across the middle of the invite. There are two sections of white coral and the lettering is done in white and gray. ​If you truly love this design, you're in luck because there's a huge selection of matching paper goods and products to choose from including an entire wedding suite of stationery. Click the image to learn more and to see the entire collection. If you're planning a Champagne brunch in honor of the bride-to-be, you're going to have a hard time deciding from these three Brunch and Bubbly bridal shower invitations. We adore them all! What better way to celebrate the love of your life marrying the love of her life than with a glass of bubbly? ​Come to think of it, what says CELEBRATION more than champagne? ​That's why Brunch and Bubbly bridal showers are trending so high on the shower theme radar right now. ​Here's 3 of our favorite Brunch and Bubbly bridal shower invites to help you kick off the big party in honor of the lovely bride-to-be. We love these invites and we think you will too! All That and Glitter Too! Along with all of your personalized information, this 5" x 7" invite features glittery silver and gold bubbles. So chic and shimmery for your elegant champagne bridal shower lunch. Coral and Aqua and Oh So Cute! This coral and aqua design has it all... stripes, flowers, a FULL glass of champagne, pearls, and her name highlighted for all to see. So romantic, girly, and super cute! When it Comes to the Bubbly there's just Never Enough! This adorable pink, gold, and black on white design is crowded with unopened bottles of bubbly and oodles of elegance. It makes a terrific way to invite guests to come along and open those bottles in honor of the beautiful bride-to-be. Each of the amazing high-quality invites featured above come with a standard white envelope and Zazzle's 100% satisfaction guarantee. ​There's a lot more where these came from too! If she's in love with the rustic look and having a rustic theme wedding, you need to see these gorgeous (and so romantic) bridal shower invites featuring images of wood and lace. You have to admit, this rustic bridal shower invitation is oozing with romance. It has a wooden barrel look background, delicate lace at the top and a simply stunning lacy wedding gown with lovely modern script writing. ​All of your personalized party information appears on the back. This chic design seems a bit more formal and yet manages to still be super cute. ​The design features a wood look background with white burlap and pretty lace. A twine bow ties the whole look together. This delightful bridal shower invite ups the ante of the trendy wood and lace by adding mason jar string lights to the equation. ​The modern personalized typography is done in bright white to make all of the information stand out in a chic and sophisticated way. Deep dark wood shows off the pretty lace bunting banner on these adorable rustic wood and lace bridal shower invitations. ​I see these being used for a farm or barn theme wedding but they can also be used with any other rustic wedding theme. Last, but certainly not least, (in fact, I truly love each of these invites equally as much as each other) we share these charming invites that feature not only the wood and lace look but also a mason jar filled with white Hydrangea flowers and the bride and groom's initials. ​This one is a sweet invite for a rustic garden theme or mason jar theme wedding shower. I personally LOVE the rustic look for an autumn bride but the trend can be suitable for any time of year and I think the 5 romantic invites I've featured here prove that. ​Did you find something you love? ​PS... If you're looking for a rustic bridal shower gift, be sure to check out my new gift blog over at Casual Rustic Chic. When I went looking for an invite to feature here today, these gorgeous rustic roses bridal shower invitations made me stop dead in my tracks because they are soooooo pretty. These pretty invites were created using photographic images of real roses and plank wood. Together with the romantic style of the white lettering, the images blend together so beautifully. I find this design to be completely elegant while also being rustic and totally feminine. ​The back of the invitation has the couple's names with more roses and wood. ​Rustic always seem like the perfect theme for a fall shower to me but with the addition of the roses on this chic invite, I think it would work for autumn, spring, or summer too!